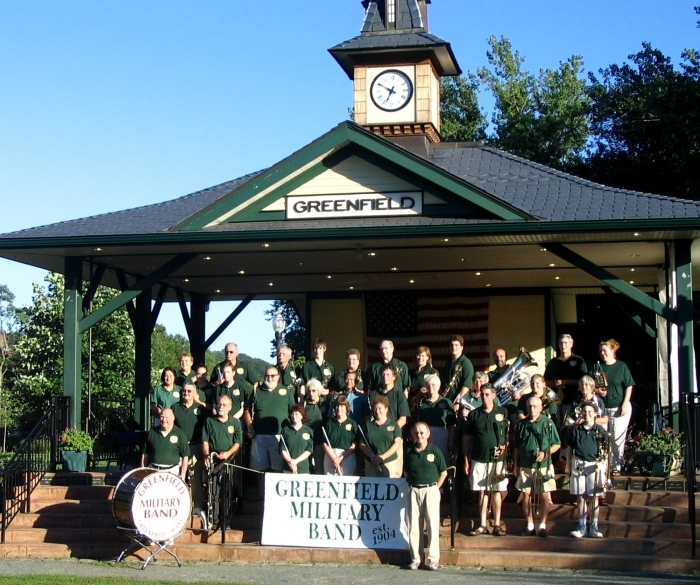 The Greenfield Military Band began in 1904 when the Town of Greenfield appropriated $700 to begin a Town Band. It is now recognized as being in the top 2% of the oldest continuing community bands in America. In the region, only the Shelburne Falls Military Band is older. Through the years the band has entertained thousands, taking part in World War I and World War II military parades and vaudeville shows at the annual Franklin County fair. Today the band no longer marches, but does take part in the parade at the Franklin County fair, riding on a flatbed truck. The band typically gives 14 annual concerts beginning in April or May and ending with the parade in September. Other concerts include every Tuesday evening in July (except July 4) at the NESEA Energy Park, informal concerts at nursing homes and extended care facilities and the feature performance at the July 4th (nearest Saturday before or after) event at Beacon Field. Most concerts last an hour; the Beacon Field concert lasts 2 hours with an intermission and is followed by the town fireworks display launched from Poet's Seat Tower overlooking the field. (C)2008-2019 Greenfield Military Band. All rights reserved.